My acupuncturist worked her magic on me but kept muttering over and over about how tense I was compared to my session just two weeks prior. Finally, after the session I told her that we were about to move to a new apartment in Tokyo, and it was just plain stressful. Adding to the stress was the fact that this would be our first move without babies. When we moved into our house six years ago, we had small kids – ages 5 and 8. We had an entire room in the house stuffed with their toys and books. Being a writer and writing teacher myself, I get very attached to books. In addition, my mother, a career kindergarten teacher, calls herself Grandma Book, and when she closed her classroom in the U.S. and moved south, she sent five packing cartons full of children’s books. But fast forward six years with kids ages 11 and 14, and most of the books and toys had to go. I spent a lot of time on the floor one weekend in early May just going through a lot of books and remembering them. Crying. Feeling. Mourning a little, even. Some special books, the ones my kids really remembered and loved, they wanted to save and keep on their shelves, and I certainly allowed that. In the end we had at least ten trash bags of toys to give away and five suitcases full of books to donate. In my heart, I knew that other kids would be able to love the books and toys as much as my babies and I had loved them, but letting go of them was tough. That’s when the acupuncturist, listening to my tale of woe, taught me a new Japanese word. “Dan-sha-ri” she told me. 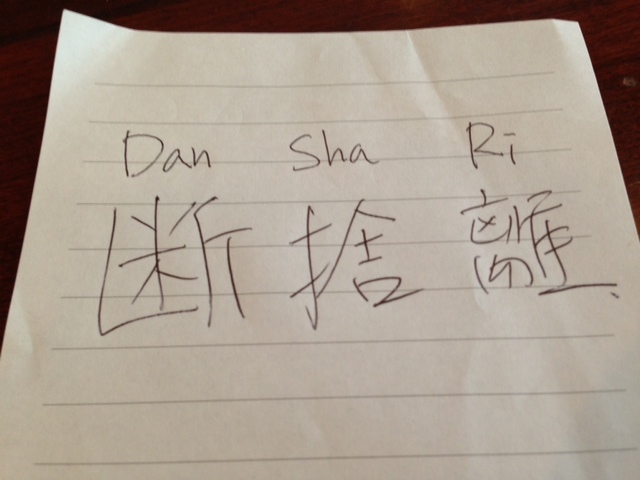 “That’s what you’re doing: Dan-Sha-Ri”. She wrote out the Kanji for me, and it’s really three Kanji put together to make up the very connotative word. Dan the first Kanji, means to refuse. People are supposed to refuse to collect more THINGS in their life, or refuse to block the flow of their lives with stuff. Sha means to throw away things – get rid of unnecessary items in the home. And Ri means to separate – separate what’s actually valuable from your possessions – your stuff is not your life; you and your memories and the people you love are your life. When put together, the word DanShaRi means to let go of possessions, but also to free yourself from them; to poetically purge what’s cluttering your life and let go of it gracefully. The result is intended to be a lighter and free-er person. Yes, I spent some serious time on the floor stressing and crying over my children’s bygone childhood, but I admit now, three weeks later, that I do feel lighter for the exercise of it. My children are growing into such fine young adults, that I find I don’t need their baby stuff anymore. I can carry the memory of their babyhood in my head and in a few photo albums without having to carry the actual, physical trappings of that babyhood – which also means that I can fully enjoy the present. I am grateful to my acupuncturist at Theracua for treating the whole person a few weeks ago, and not just my joints and muscles. She made the process of DanShaRi in my life a whole lot less stressful and more of a thankful experience. Sometimes the connotative, on-the-fly nature of Japanese has just the right word for the situation.